11. 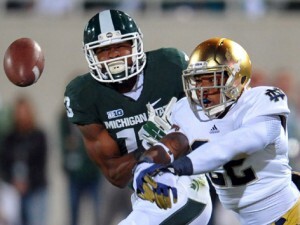 Elijah Shumate – With his sophomore season just around the corner, Elijah Shumate is set to have a big year. With the loss of Zeke Motta to the NFL, someone is going to need to step up and fill the void left. Shumate can be that man. 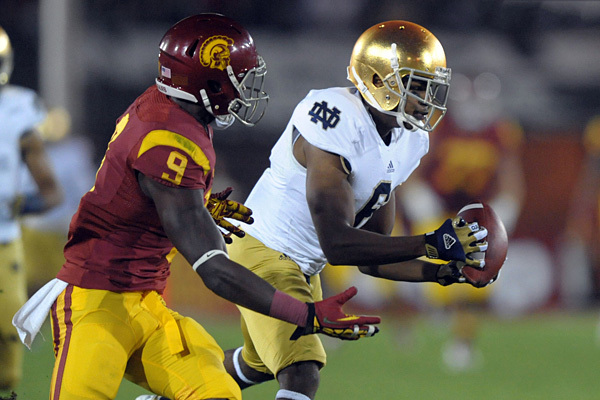 Last year, Elijah played primarily in nickel packages but made numerous plays on third downs for the Irish. If he can learn the nuances of the safety position, he’ll be primed for an even bigger impact this year. 10. CJ Prosise – After the transfer of slot wide receiver, Davonte Neal, many Irish fans worried and wondered where the team would find another slot man. Coach Kelly found his answer on the defensive side of the ball in CJ Prosise. Prosise was a 3-star recruit that was recruited as a safety. After all is said and done, Prosise will prove just how little star ratings mean. He has already received a high amount of praise from the Irish coaching staff and was one of the bright spots in the spring game. 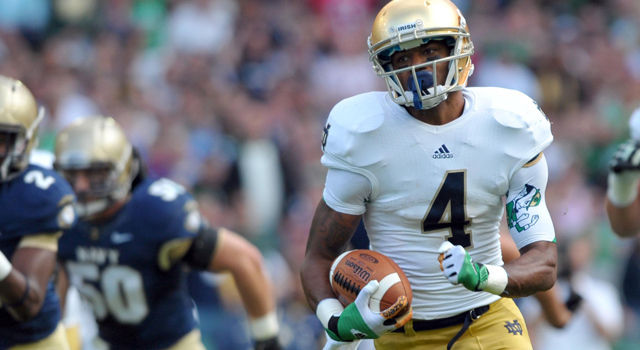 CJ made a few catches and had a long touchdown reception from Malik Zaire. 9. Corey Robinson – As if it hasn’t been said enough before, being the son of David Robinson is no easy task; those are some big shoes to fill. Luckily for Notre Dame, Corey Robinson, son of the Admiral, will be stepping into his own shoes on the football field. Being that Robinson was an early enroll, most fans were looking forward to watching him in the spring game. Unfortunately for them, he hyper-extended his elbow making a diving one-handed catch in practice. The Irish faithful will have to wait until this season to see what Robinson has to offer. Notre Dame is going to be looking for that big time receiving threat that is able to go up and get the ball in the endzone. Much like Michael Floyd’s role in his early years, Robinson’s size and athleticism gives him the natural ability to go up and compete for it. 8. KeiVarae Russell – Coming into last season, everyone was questioning the Notre Dame secondary. After Lo Wood went down, people were really starting to worry. 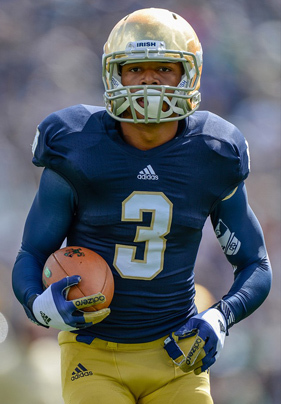 In stepped freshman KeiVarae Russell who most thought was going to Notre Dame to be a running back. You can imagine the panic and worry of the Notre Dame fanbase. Five months later, Russell was named a freshman All-American cornerback. He has great speed to keep up with the elite receivers and made many big plays throughout last season. One such play was an interception on a deep pass against USC that helped Notre Dame lock up a spot in the national championship. With one year under his belt, Russell is only going to get better. 7. Greg Bryant – Many times you hear about teams reeling in these elite 5-star recruits, but they don’t see the field for a couple years. That won’t be the case with freshman running back Greg Bryant. Bryant was one of the best surprises during the recruiting season. And during the 2013 football season he could be the same. While most high schoolers aren’t ready physically to step onto the college football field, look at Greg Bryant on film or in the weight room and you will quickly understand that this kid is ready to be a big time playmaker immediately. Despite the talent already at the running back position including Amir Carlisle, George Atkinson III, etc., Bryant should be getting some carries and chances to show that he can live up to the hype. 6. DaVaris Daniels – Coming into this season, a small contingent of Notre Dame fans are worried about the receiving corp. After losing the top receiving threat in tight end Tyler Eifert, Notre Dame will be looking for someone to step up and make big time plays. This is where DaVaris Daniels will step in. Daniels showed a great deal of potential last year and I expect him to be in or near the top tier of wide receivers in the country this year. Daniels was part of a number of big plays for the Irish last year including a nice sideline grab versus Stanford in overtime and a long reception downfield versus Pittsburgh to help setup the game-tying touchdown. Also, some may have forgotten (or wanted to forget) the national championship because of the lopsided score, but DaVaris reeled in six receptions for 115 yards. Amazingly, despite his impressive play, he did not record a single touchdown last year. I have a feeling that will be much different this year. 5. Jarrett Grace – Replacing an icon is never an easy task, but we will find out if Jarrett Grace is up to the task. One of the things that made Manti Te’o such a legendary player was his leadership on and off the field. No one really knows how Grace will be, as he hasn’t had to be a leader thus far at Notre Dame. But according to some close to the program, Jarrett will exceed all expectations. After seeing Grace play in the spring game and from hearing the coaches talk of him, it seems like the sky is the limit. 4. George Atkinson III – George Atkinson III grabbed the attention of Notre Dame fans his freshman year with big kick returns for touchdowns vs. Michigan State and USC. On his returns, fans could see the top notch speed that Atkinson contained. Before the season last year, I warned fans of opposing teams that Atkinson is one of the fastest players in college football to which I was constantly mocked. After long runs versus Navy and Miami last year where he outran the whole defense, people can no longer doubt his top tier speed. Not to mention George and his brother Josh helped lead the Notre Dame track team to a Big East Title their freshman year. Atkinson was 8th in the nation last year among running backs averaging 7.08 yards per carry. GA3 is great outside of the tackles, but the key is to get him to become an elite running back inside the tackles. If he can do this, look for Notre Dame and Atkinson to have a monster season. 3. Jaylon Smith – Throughout the NFL draft combine, all the talk was about Manti Te’o and his slow forty time. Of course, no one wanted to comment about his natural instincts, athleticism, or leadership traits. Well, if ND went 12-1 with a linebacker that “could only run a 4.7 forty,” then how good are the Irish going to be with freshman linebacker who runs a 4.4 forty? Jaylon Smith is a freak athlete that is a true leader (as seen during the recruiting process), has good instincts, and can cover a lot of ground. The thing that impressed me most when watching his high school highlights was watching him drop back into coverage on a receiver, seeing the quarterback roll out, and leaving the receiver while still making it in time to get the sack. Jaylon may not start game one versus Temple, but I am sure you will see him making a lot of plays this year. 2. Tommy Rees – Notre Dame football is built on legend and lore, whether it be Rudy or “Win one for the Gipper.” However, with a great season this year, Tommy Rees could have one of the best stories in Notre Dame history. The Kelly mantra of “Next Man In” doesn’t ring any truer than for Rees. Freshman year – Dayne Crist goes down, Rees goes in to win four straight. Sophomore year – Crist struggles first game of the season, Rees comes in and leads the Irish the rest of the season. Junior year – Redshirt Freshman QB Everett Golson struggles at times, Tommy comes in to help the Irish beat Purdue, Michigan and leads ND to an overtime victory against Stanford after Golson was injured. We all know his limitations, but he seems to find ways to help ensure his team wins games. Sadly, because of his weaknesses and turnovers early in his career, a part of the fanbase has turned on him. However, I think Tommy will win them back this year with his advanced knowledge of the offense. Just remember quarterbacks like Quinn and Clausen early in their careers before you try to judge Tommy’s performance. He is a senior, with a good amount of experience over his three years at ND. And with the talent that surrounds him, he is set to have a big breakout year for the Irish.